Iron Man Comic Lot 236, 237, 238, 239, 240. Shipped with USPS Priority Mail. Iron Man Annual #s 5,6,7,8,9-F/VF,$0.01 Combined Shipping Offer! 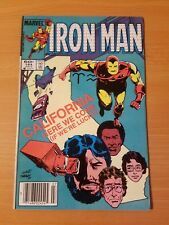 Iron Man Annual #s 5-9-F/VF. Iron Man #s 220,221,222,223,224,226,227,228,229,230-F/VF,Combined Shipping! Iron Man #s 233,234,235,237,238,239,240,241,242,243-F/VF,Combined Shipping! Iron Man #s 209,210,211,212,213,214,216,217,218,219-F/VF,Combined Shipping! Iron Man #s 200,201,202,203,204,205,206,207,208-F/VF,Combined Shipping! #206- Hawkeye & mockingbird app. Lot of (29) What If Special #1 1988 Marvel Comics. I do not list condition but I try to describe any noticeable defects, and provide as many photos to help. Majority of the comics I have listed exhibit minimal to light handling & storage wear. Even through ive been collecting comics for 15 yrs im not a professional grader so look at pictures and judge for yourself. All pictures and scans are of the actual comics you will receive. Iron Man # 181-184. Founded in 2000, CGC is the first independent, impartial, third-party comic book grading service. Iron Man 200 CGC 9.4 NM. United Kingdom 24.00 57.25. Prices on chart are for one book. Japan 23.50 55.45. I'm adding books daily so be sure to check them out. Grades are listed for each book and any standout issues will be listed in the notes above. Up for sale is. Iron Man #219. This book is professionally graded by the CGC. This comic has a grade of9.4 and has OW to WHITEPAGES. We recently obtained a large collection of comics! Comic Bk Text. Note that I am not a professional grader, but will do my best to provide fair grading. The photo is an actual pic of the item. The comics pictured are the comics sold. Grading is subjective. I frequently run promotions so if you buy more than one item you can get up to 25% off the buy it now prices. Up for auction is a great lot of Iron Man comics from Marvel. Included in this lot are issues: 75,77,100,182,228,239,303,332, and two copies of Annual 6 - 10 books in all. Conditions of the books vary greatly, with the newer books being in the VF (very fine) range and the older books more in the G/VG (good to very good) range in my opinion. Comics will be bagged, boarded, and shipped securely. I will combine shipping if you purchase multiple items from. Please wait to pay until I send an invoice for the shipping. 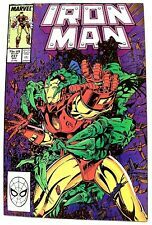 IRON MAN ORIGINAL SERIES #236 THE GREY GARGOYLE MARVEL 1988 NICE!! THE GREY GARGOYLE. ORIGINAL SERIES #236. New "Buy It Now's" are added weekly. We are not professional GRADERS. THE BOOK SHOWS VERY LITTLE WEAR FROM AGE AND HANDLING. Single books are bagged and boarded. CHECK OUT THE OTHER COMICS FOR SALE & SAVE. 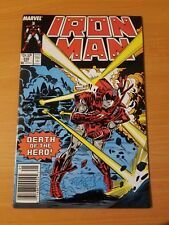 -- Sunday Night Auctions -- Title and Issue Iron Man #219 Year 1987 Publisher Marvel Condition/Notes The cover and centerfold are attached fine, the pages are supple and off-white, lies flat, light wear consistent with the grade, a sharp copy. Please look at the scans for condition. Combined shipping. Grade 9.0. IRON MAN #219 JUNE 1987. The comics are in Very Fine (8.5) condition. ALL COMICS ARE BAGGED AND BOARDED! Old Marvel comic Book issue number one. What if iron man was a Traitor. We have recently cleaned out an old estate with lots of stuff in it.we will be listing here on ebay, there are lots of comics. We do not grade comics ,we are in the cleanout business.please check out our other ebay auctions for other great items. We would be more than happy to combine shipping to save u money.if u purchase more than 1 item ,send us a message so we can prepare an invoice with the combined shipping before paying each individual item.thank you for looking and good luck. 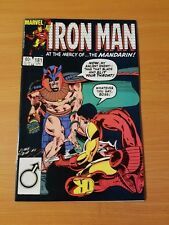 Iron Man # 196 VG/FN 5.0. Off white pages. Goof gloss and color. Blunted corners. NOV. 1988 SUPERMAN No. 23 DC COMIC BOOK In VF-NM Condition. Great comic to add to your Superman collection and one we are positive you will enjoy. Thanks for shopping with us and have a great day. #213- intro new Dominic fortune. This copy is about FN/VF, looks decent. "Star Hunter!". Art by Jackson Guice and Bob Layton. When Iron Man investigates an abandoned space lab orbiting high above the Earth, he discovers a massacre. And, the creature responsible has taken up residence. Iron Man 200. Comic is in great shape. Published by Marvel Comics from 1968 to 1996 for 332 issues, 15 annuals and a Giant-Size. The photo is for identification but you will receive one as described and it is bagged and boarded for its protection. This copy is about VF-, looks decent. "The Iron Destiny" Part 1 of 2. Script by Denny O'Neil. Pencils by Luke McDonnell. Inks by Ian Akin and Brian Garvey. Cover by Luke McDonnell, Ian Akin, and Brian Garvey. Is Tony really ready to wear the suit again?. Story by Carrie Barre. Art by Steve Ditko. Story by Roy and Dann Thomas. Art by Tom Morgan and Randy Emberlin. Iron Man and Machine Man wage a fierce battle to stop the powerful robot. Iron Man gets involved in a protest for the rights of handicapped people.